This is the first time in a while that we are seeing those with influence on the stock market come out and say that stocks may not be the best place to put your money. In simple words, BlackRock, a global investment management company with over $6.0 trillion under administration, is saying that the stock market could register dismal returns in 2019. We hear something similar from former Federal Reserve chairman, Alan Greenspan. In case you didn’t know, Jeffrey Gundlach has about $200.0 billion under management. Dear reader, the calls for the stock market facing headwinds continue to increase each day. We are seeing big banks and influencer personalities coming out against stocks. Don’t ignore it whatsoever. We haven’t seen this sort of thing in a while. Don’t forget, big banks and massive institutions have a lot of influence over investors. If they turn bearish, at times, investors follow their advice. If this noise gets louder, don’t be shocked if investors rush for the exit and sell. This could create a major sell-off on the stock market—much worse than what we saw in November and December of 2018. I also want readers to look at the chart below and pay close attention to the drawn lines. We currently have a downtrend emerging on the S&P 500; it’s making consistently lower lows and lower highs. 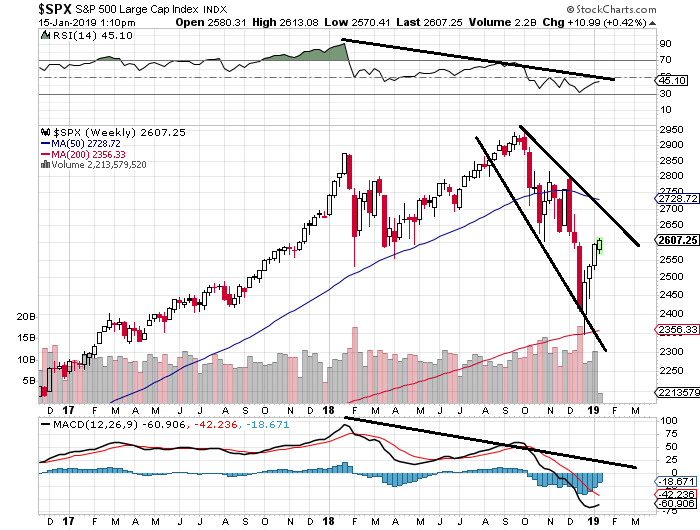 Also, the momentum indicators are suggesting that sellers are still in control of the price and could take the stock market much lower. The rallies we have seen over the past few weeks have been based on low volume. This tells us that buyers are not that excited or that the rally could be based on short covering rather than excited buying.